Boca have scored four away and conceded 10. That hints at a home win and [2.21] for a River victory seems generous. Argentina has been waiting for this fixture for a long time, longer than anybody in any previous era would ever have believed possible. Sunday sees the first superclasico for 17 months as River Plate face Boca Juniors at El Monumental. It's fifth against 11th and, unless Boca win and somehow haul themselves back into the title race - at the most they trail Newell's Old Boys by five points - it means nothing in terms of silverware. Yet it means everything in terms of prestige. The superclasico dominates Argentinian football to an extraordinary extent, no matter where the teams are in the league - which is perhaps understandable given 70 per cent of the country support one team or the other. It's the game everybody has been focused on since River responded to relegation with promotion at the first attempt - which is just as well, because neither side has been playing particularly well. Having gone top with a 2-1 win over Independiente on 16 September, Boca's form has collapsed with away defeats at Lanus and Belgrano and home draws against San Martin and, on Sunday, Estudiantes. That game, a dismal, scratchy 0-0, highlighted all that is wrong about this Boca, the lack of flair, the lack of invention, the lack of fluidity. Julio Cesar Falcioni, their uncompromising manager, may argue that at least under him, when Boca play badly, they are defensively well-organised enough that they tend to get away with draws (although that capacity seems to have left them away from home), but frustration is mounting. There have been reports this week that Falcioni's contract will not be renewed when it expires at the end of the season and that Carlos Bianchi is being lined up for (another) return to the club. There were even suggestions that Juan Roman Riquelme, who stopped playing at the end of last season (retirement? Protest at Falcioni's supposed defensiveness? It was never entirely clear) has been putting himself through an extensive fitness regime to make (another) return. In some ways that is to be applauded. Riquelme may be an anachronism and he may have behaved like a dreadful diva in his relationship with Falcioni but he remains a wonder and anything that can postpone his disappearance from the game is a positive. Bianchi, meanwhile, is a great of the game; he's a Larry David lookalike who has won four Libertadores titles. While the return of Bianchi and Riquelme would add to the fun of football, the whole business seems remarkably unfair on Falcioni, who ended three years without success at Boca by winning the apertura undefeated last season, and had them on course for a treble of Copa Argentina (which they did win), Copa Libertadores (they lost in the final) and clausura (they took one point from their last three matches to hand the title to Arsenal), before the disagreements with Riquelme overwhelmed the club. River, meanwhile, are astonishingly inconsistent. 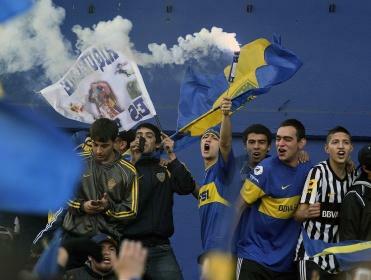 They went five games without a win, then hammered the champions Arsenal 4-0 away and beat Godoy Cruz 5-0 at home. Any thought the corner has been turned, though, vanished on Sunday with a 1-0 defeat at Quilmes. Nobody is talking about it too loudly but thanks to the system of determining relegation on an average over the past three seasons, it wouldn't take much for River once again to slide into trouble. Boca are clearly better than present form suggests; River are so inconsistent it's hard to know how good they are. River have won just one of five at home this season, Boca just one of five away. River have scored nine at home and conceded six; Boca have scored four away and conceded 10. That hints at a home win and [2.21] for a River victory seems generous. Equally, while there's a tendency to think of derbies as hard-fought, tight affairs and while Falcioni is more than capable of sending out a side simply to defend, given River's home matches average three goals per game and Boca's away matches 2.8, the [2.38] available on over 2.5 goals also looks enticing It may be worth waiting to see if David Trezeguet, who missed the defeat to Quilmes, is fit, but if he is, backing goals makes sense.